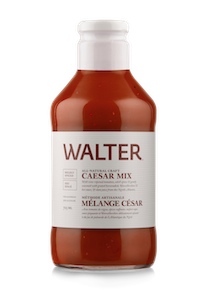 Walter All-Natural Craft Caesar Mix makes a perfect Caesar Cocktail every time. The new premium mix is made with real whole ingredients like vine-ripened tomatoes, Worcestershire sauce, hot sauce, grated horseradish, spices and real clam juice, and is produced in small batches. Varieties include Mildly Spiced and Well Spiced. As well as appearing at fine restaurants and bars, the mix is available in 725-mL glass bottles at select grocery and specialty stores, retailing for $7.99.